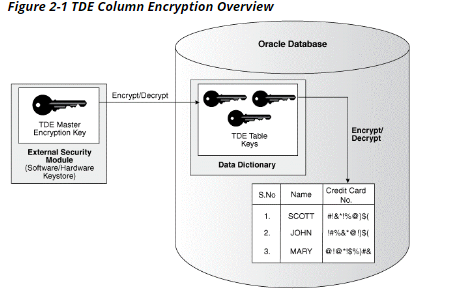 What is Oracle Transparent Data Encryption (TDE)? 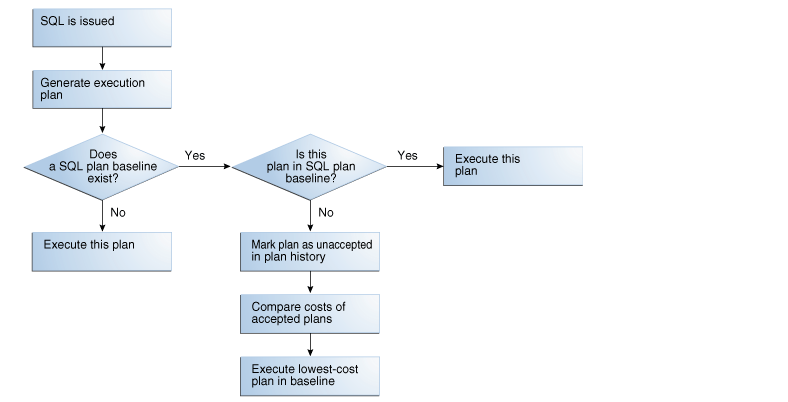 How do I migrate existing clear data to TDE encrypted data? How to find details for encryption/encrypted objects? How to Enable TDE in 12C? by protecting it from unauthorized access via encryption key if storage media, backups, or datafiles are stolen. TDE uses a two tier encryption key architecture, consisting of a master key and one or more table and/or tablespace keys. The table and tablespace keys are encrypted using the master key. The master key is stored in the Oracle Wallet. 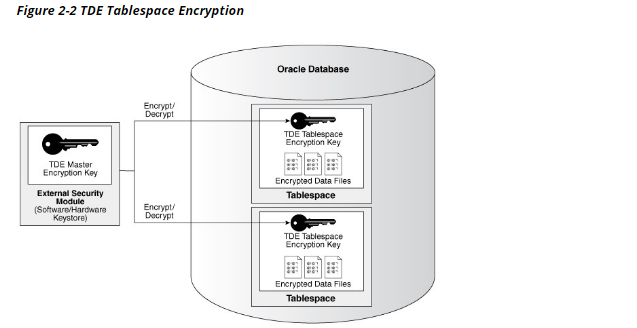 When TDE column encryption is applied to an existing application table column, a new table key is created and stored in the Oracle data dictionary. When TDE tablespace encryption is used, the individual tablespace keys are stored in the header of the underlying OS file(s). 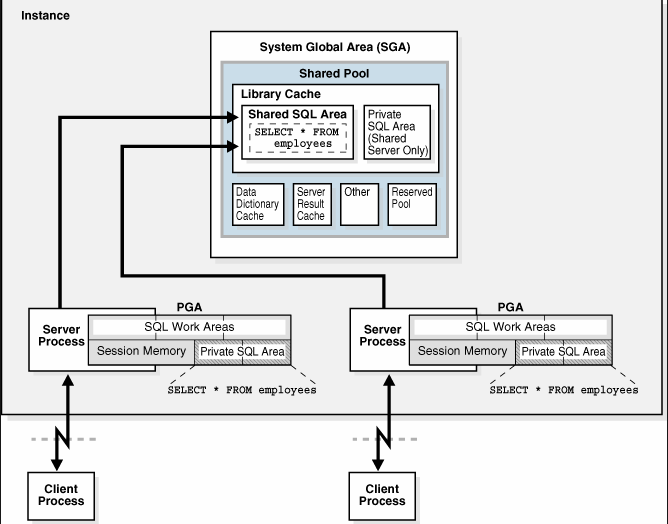 You can  migrate existing clear data to encrypted tablespaces or columns using Online/Offline. Existing tablespaces can be encrypted online with zero downtime on production systems or encrypted offline with no storage overhead during a maintenance period. 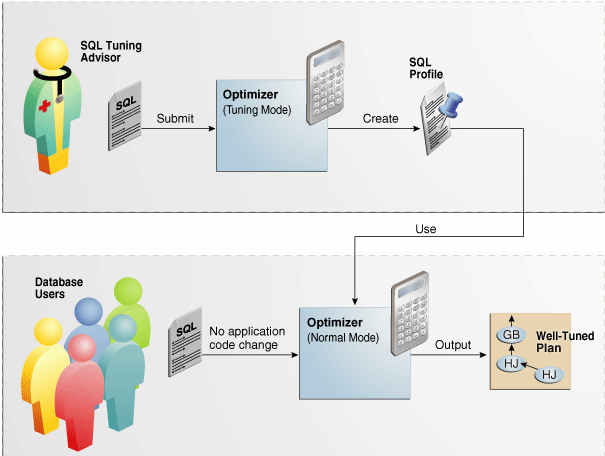 Offline conversion  on Oracle Database 11.2.0.4 and 12.1.0.2. In 11g/12c,you can use DBMS_REDEFINITION(Online Table Redefinition) copy existing clear data into a new encrypted tablespace background with no downtime. --> Make sure compatible parameter value greater than 11.2.0. –> Make sure compatible parameter value greater than 11.2.0. By default,data in the resulting dump file will be in clear text, even the encrypted column data. To protect your encrypted column data in the data pump dump files, you can password-protect your dump file when exporting the table.